Drew’s Brews was recently featured in Southwest Magazine, an inflight magazine reaching nearly 3.5 million travelers each issue. See the article for yourself on the “Found in Nashville” page here: http://paceco.imirus.com/Mpowered/book/vpco15/i7/p1. “We are excited to have been highlighted in such a well-respected magazine like Southwest,” said Drew. 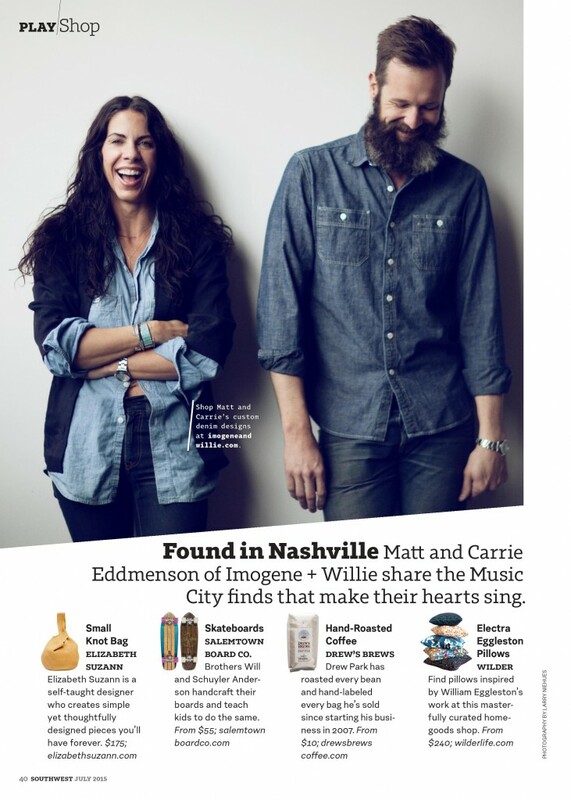 In the article, Matt and Carrie Eddmenson of Imogene and Willie reveal their top Nashville finds – one of which is Drew’s Brews handcrafted coffee. Imogene and Willie is a shop offering men and women’s clothing, home goods, denim care and one-of-a-kind products. Learn more by visiting http://www.imogeneandwillie.com/. Drew’s Brews is a Nashville staple for consumers and casual coffee drinkers alike. You can try our coffee by visiting one of our many wholesalers, including Ugly Mugs, Whole Foods, and Sam and Zoe’s. Interested in offering Drew’s Brews at your location? Give us a call today at (615) 262-4099.